Journal of Orthopedic Surgery and Rehabilitation, a newly launched journal which will be dedicated to advancing the science and practice of Orthopedic Surgery through the rapid publication of high-quality original research, systematic reviews, meta-analyses and technology reports, perspectives on all disciplines and therapeutic areas within the specialty. The journal is directed to Rehabilitation of Orthopedics and is concerned with conditions involving the musculoskeletal system. 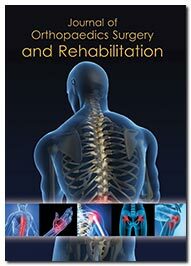 It features original research, review articles, clinical cases, perspective, commentary and others which include every facet of the musculoskeletal system to find better ways to treat musculoskeletal trauma, spine diseases, sports injuries, degenerative diseases, infections, tumors, and congenital disorders. The mission of Journal of Orthopedic Surgery and Rehabilitation is to provide readers with a broad spectrum of themes in clinical and basic research studies related to musculoskeletal issues, orthopedic surgery, osteoporosis and related treatment regimes, foot and ankle surgery, medicine for osteoporosis, orthopedic trauma, arthritis, musculoskeletal system, orthopedic oncology, surgical sports medicine, spine surgery, pediatric orthopedics, laminectomy, orthopedic nursing. The principal criterion for publication is potential impact on patient care. Journal of Orthopedic Surgery and Rehabilitation is an open access journal designed for the wide dissemination of research in this field to worldwide audience. New developments in methodology and techniques are important resources for the research community. With an emphasis on conceptual breakthroughs, its goal is to facilitate rapid publication and circulation of novel discoveries in the field of osteoporosis, orthopedic trauma, arthritis, musculoskeletal system, orthopedic oncology, surgical sports medicine and other aspects relevant to musculoskeletal that affect the delivery of care of patients with degenerative diseases. The journal scope encompasses the knowledge in research of the musculoskeletal system such as orthopedic oncology, spine diseases, sports injuries, degenerative diseases, infections, tumors, and congenital disorders, bone density, diseases associated with bone, such as bone cancer, bone marrow replacement or transplantation, injury, other musculoskeletal issues, orthopedic surgery, osteoporosis and related treatment regimes, foot and ankle surgery, medicine for osteoporosis, studies associated with periacetabular osteotomy, osteoarthritis, orthopedic trauma, arthritis, musculoskeletal system, surgical sports medicine, spine surgery, pediatric orthopedics, laminectomy, orthopedic nursing, orthopedic implants etc.